An in-depth report on the causes, diagnosis, treatment, and prevention of chronic obstructive pulmonary disease (COPD) -- emphysema and chronic bronchitis. Chronic obstructive pulmonary disease (COPD) is the fourth leading cause of death in the United States. The disease is characterized by an abnormal inflammatory response in the lungs and restricted airflow (documented by breathing test). The disease typically develops after age 35. Cigarette smoking remains the major cause of COPD. Smoking also accounts for about 80% deaths related of COPD. Quitting smoking can improve or stabilize lung function and help to prevent death from COPD. However, smoking isn't the only cause of COPD, and up to 1 in 4 people with COPD have never smoked. Other causes, such as genetic syndromes (alpha-1 antitrypsin deficiency) and exposures to pollutants such as dust, irritants and fumes can also contribute to the disease. An overall treatment strategy may include medication, lifestyle changes, education, pulmonary rehabilitation, oxygen therapy, and perhaps surgery. Patients and caregivers must assess the benefits and side effects of treatment options. The choices among options for inhaled therapy may be based on patient preference, side effects and cost. Much research is underway to assess the merits of individual (mono-therapy) vs. combination therapy options as well as the long-term safety of COPD medications. Combination therapy can reduce the risk of exacerbations. But the treatment must take into account the increased risk of side effects. Current guidelines support long-acting beta-agonists and anti-cholinergics as primary therapy, supplemented by regular use of corticosteroids for people who experience frequent exacerbations. A combination anticholinergic and long-acting beta-2-agonist inhaler (Anoro Ellipta) and most recently a combination of anticholinergic, long acting beta-2-agonist, and steroid inhaler (Trelegy Ellipta) are also available. Corticosteroid medications are often given to people seeking care for an acute exacerbation. While a 14 day treatment is common, a 5 day course may be just as effective in keeping people from having another attack for at least 6 months. Pulmonary rehabilitation may offer benefit to people who experienced a recent exacerbation of COPD. It may reduce hospital admissions and mortality, and improve quality of life. While once reserved for people with severe disease, it can also be beneficial to those with less severe disease. Two new endobronchial valve systems have recently been approved by the FDA for people with severe COPD (Zephyr and Spiration). The American College of Physicians (ACP), American College of Chest Physicians (ACCP), American Thoracic Society (ATS), and European Respiratory Society (ERS), have produced clinical guidelines for the diagnosis and management of COPD. They stress the importance of patient history and physical examination for predicting airflow obstruction, spirometry for screening or diagnosis of COPD, and assessing management strategies including inhaled medications, pulmonary rehabilitation and supplemental oxygen. Chronic obstructive pulmonary disease (COPD) is a condition in which there is reduced airflow in the lungs. The disease develops and worsens over time. COPD is not reversible. But therapy can slow its progress, reduce symptoms, and improve quality of life. Although patients can breathe in normally, changes in the small airways cause the tubes to narrow during expiration, making it hard to breathe out. In many patients with advanced COPD, the small sacs where oxygen and carbon dioxide are exchanged are destroyed, gradually depriving the body of enough oxygen. Being out of breath. At first when doing physical activities, but also at rest as lung function deteriorates. Spitting or coughing mucus (phlegm). Much worse breathing symptoms with anxiety. The ability to exhale (breathe out) gets worse over time. The lungs are located in the chest cavity and are responsible for breathing. 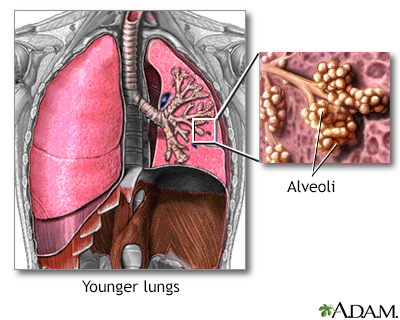 The alveoli are small sacs where oxygen is exchanged in the lungs. , both of which are covered in this report. Not all people with emphysema or chronic bronchitis have a diagnosis of COPD. There must be an obstructive airway component that cannot be reversed. The third, less common disease, is obstructive bronchiolitis, an inflammatory condition of the small airways. Asthma shares some of the same symptoms of COPD. But it is a very different disease. People can have asthma and COPD at the same time. Because smoking is a common cause of both emphysema and chronic bronchitis, these conditions often develop together and frequently require similar treatments and approaches. When chronic bronchitis occurs together with emphysema, it is often difficult for a physician to distinguish between the two diseases.
) form in the injured areas. The pockets interfere with the normal working of the lungs by narrowing the airways, trapping air, and making breathing out more difficult. The ability to breathe in is not affected. Until the late stages of the disease, oxygen and carbon dioxide levels remain normal. Inflammation of the bronchial tubes (from smoking and air pollution) causes the production of mucus, which clogs the airways and makes breathing difficult. The mucus is cleared through coughing. Both constant coughing and inflammation can damage the bronchial tubes. The tubes swell and thicken, leaving less room for air flow. The lungs are two spongy organs surrounded by a thin, moist membrane called the pleura. Each lung is made up of smooth, shiny lobes. The right lung has three lobes, and the left has two. About 90% of the lung is filled with air. Only 10% is solid tissue. When the person breathes in deeply, the elastic alveoli unfold and unwind to allow this exchange of gases to occur. From the capillaries in the lungs, red blood cells carry oxygen throughout the body through blood vessels, and then return carbon dioxide to the lungs. Cigarette smoking is the most important cause of COPD. Cigarette smoke contains irritants that inflame the air passages, setting off a chain of events that damage cells in the lung, increasing the risk for both COPD and lung cancer. Smoking isn't the only cause of COPD, however. In most studies, smoking accounts for about 80% of COPD cases. Other causes, such as genetic syndromes (alpha-1 antitrypsin deficiency), exposure to pollutants such as dust, irritants and vapors, and asthma are also involved in the development of this disease. The key process leading to emphysema is not well understood. It appears that inflammatory cells (T lymphocytes, neutrophils, and alveolar macrophages) release chemicals called enzymes that attack the tissue in the deepest part of the lung where oxygen and carbon dioxide are exchanged. As a result, airways become narrowed, breathing out becomes difficult and the vital air sacs themselves are damaged and eventually destroyed. Damage to the cilia, the hair-like waving projections that move mucus, bacteria, and foreign particles out of the lungs. When cilia are injured, foreign substances become trapped in the lungs and can cause infections that lead to chronic bronchitis. Enlargement of the mucus glands in the large airways of the lungs. Excess growth of smooth muscle cells in the airway. The typical COPD patient is a current or former smoker, over age 50, with a pack-a-day habit of more than 20 years. Lung function continues to get worse as the person ages. On the positive side, smoking rates in the United States are dropping, and the proportion of adults under 55 with COPD is gradually declining. This indicates that the high death rate will eventually level out. In particular, the rate of COPD in young African Americans is declining significantly. The rate in younger white people is not decreasing as dramatically. The longer a person smokes, the higher the risk for emphysema. Most patients have smoked the equivalent of one pack a year for 20 years, and many have smoked the equivalent of 40 years or more. Once a smoker quits, the rate of lung function loss becomes the same as in a nonsmoker; however, much of the lung damage that occurred during smoking may not be reversible. People who smoke both tobacco and marijuana face nearly three times the risk of developing COPD compared to nonsmokers, although smoking marijuana alone does not seem to increase the risk. Researchers say there may be a synergistic effect, in which marijuana increases the susceptibility of the airways to the detrimental effects of tobacco smoke. Breathing in secondhand smoke may also increase the risk for COPD, because the irritants from cigarette smoke get into the lungs. Different effects of smoking can lead to emphysema or chronic bronchitis. But smokers generally have signs of both conditions. Emphysema caused by smoking most often occurs in the upper lobes of the lungs. Smoking tobacco is a major risk factor for COPD, yet an estimated 25% to 45% of COPD patients in the developing world have never smoked. In underdeveloped countries, exposure to industrial pollutants in poorly ventilated work areas, and cooking over wood and coal fires (biomass) are also major contributors. Various factors, such as genetic abnormalities, may be necessary for people to develop the airway damage that leads to COPD. The link may be a gene called ADAM33, which researchers have discovered is more common in smokers with COPD than in those who don't have the disease. Other genetic variants linked to the disease have been discovered on chromosome 4, as well as in the gene for the a-nicotinic acetylcholine receptor, CHRNA 3/5 (a chemical messenger that has also been linked to smoking and lung cancer),IREB2 (iron regulatory binding protein 2), and AGER (advanced glycation end product-specific receptor). Alpha-1 antitrypsin deficiency (A1AD) is the only known genetic risk factor that has been associated with the emphysema type of COPD. About 1% to 5% of people with COPD have this disorder, which prevents their bodies from making enough of the protective enzyme, AAT. Without enough AAT, damage occurs in both the walls of the alveoli and the airways leading to their destruction. Because smoke is a major toxin and deactivates any amounts of AAT that do remain, smokers with AAT deficiency have almost no chance of escaping emphysema. Nonsmokers are also at high risk, however. Emphysema in people with A1AD develops in people as early as 30 years of age, who are usually of Northern European descent. Screening tests are now available to detect the genetic defect that causes A1AD. Couples with a family history of the disease may want to be tested for the deficiency, so they may take protective measures for themselves and any future children they may have. If the condition is already in the family, testing the children is important. People with A1AD who are over age 30, younger A1AD patients who have respiratory symptoms and are nonsmokers, and those with severe and rapidly progressing disease should be screened for COPD each year with lung-function tests. Other rare genetic conditions have also been suggested as possible causes of COPD in non-smokers, including cutis laxa, Marfan syndrome, and Ehlers-Danlos syndrome, although these links have not yet been proven. Certain bacteria, particularly Streptococcus pneumoniae, Haemophilus influenzae, and Moraxella catarrhalis, are common in the lower airways of nearly half of chronic bronchitis patients. However, the role of bacteria, viruses, and other organisms in causing chronic symptoms and inflammation is unclear. Some experts believe that a low-level infection in the lungs may trigger an inflammatory reaction that continues to produce acute attacks. Viruses may also exaggerate the lung response to infections, leading to exacerbations of COPD. The hallmark symptom of COPD is shortness of breath that gets worse over time. It is often accompanied by a phlegm-producing cough and episodes of wheezing. Symptoms may vary, however, or others may be present, depending on the disease involved. 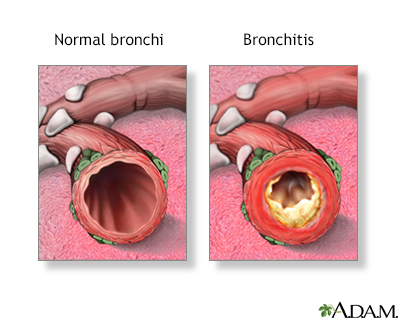 Many patients have symptoms of both chronic bronchitis and emphysema. The main early symptom is shortness of breath with light physical activity. Coughing is usually minor, and coughs produce little sputum (phlegm). Late, severe symptoms include rapid, labored breathing, and persistent craving for air (air hunger), even during rest or after minimal physical activity. Involuntary weight loss and muscle wasting may occur, and can indicate a poor outlook. A chronic cough is the hallmark symptom of chronic bronchitis, even in its early stages. Coughing with excessive phlegm (productive or wet cough) occurs on most days for at least 3 months of the year, during 2 consecutive years. Coughing often starts before shortness of breath. Shortness of breath occurs, but it may not be as severe during rest as it is in people with emphysema. Lying down at night worsens symptoms in patients with chronic bronchitis and heart failure. So people must sleep propped up. In the late, severe stages of the disease, a lack of oxygen causes the skin to have a blue color (cyanosis). The body may swell from fluid buildup caused by heart failure. Several diseases have similar symptoms and may occur with COPD. Viruses and bacteria can cause acute bronchitis. In most cases, it does not require treatment. The cough typically lasts for 7 to 10 days. In about half of patients, however, coughing can last for up to 3 weeks, and 25% of people continue to cough for more than 1 month. People with severe symptoms may need antibiotics. The classic symptoms of an asthma attack are coughing, wheezing, and shortness of breath (dyspnea). People with asthma typically have trouble breathing and may wheeze when breathing out. People may experience irritation of the nose and throat, thirst, and the need to urinate before an asthma attack begins. Some people experience chest tightness or pain, or a nonproductive cough that occurs without wheezing. About 75% of people have chest pain. The pain can be very severe, even if the asthma attack itself is not severe. At the end of an attack, a person will often have a cough that produces a thick, stringy mucus. Asthma tends to be reversible and after the attack resolves, people feel much closer to normal than those with COPD. People with chronic asthma can get airway obstruction that makes them more likely to develop COPD. However, researchers aren't sure whether people with chronic asthma have symptoms similar to COPD, or if they have COPD itself. COPD affects more than 6% of people in the United States. It is currently the third most common cause of death in the United States (behind heart disease and cancer), responsible for more than 100,000 deaths each year. Although COPD has traditionally been considered a man's disease, an increase in the rate of smoking in women has caused COPD to skyrocket in women. Women with COPD tend to fare worse than men. They are more likely to be hospitalized and to die from COPD. They also have more severe symptoms, greater depression, and a worse quality of life than men. Women appear to be more susceptible to the effects of smoking and pollution, possibly because of hormones or other genetic differences. The good news is that women who stop smoking get their lung function back more quickly than men. The leading cause of death from COPD is respiratory failure. However, people with mild-to-moderate COPD also tend to develop cardiovascular disease or lung cancer. This likely occurs from inflammation, which is involved in all three diseases. Traditionally, doctors have measured the severity of COPD by the amount of air that a person can forcibly exhale in one second (FEV1). This amount decreases as COPD gets worse. However, COPD affects other systems and body parts, which provide clues about the severity of the disease. Many physicians use the BODE index to categorize COPD and predict the patients' chances of survival. BODE stands for body mass index, degree of airflow obstruction, dyspnea (breathlessness), and exercise capacity as measured in a 6-minute walk test. If emphysema is detected before it causes symptoms, there may be some chance of reversing it. However, permanent changes in the alveoli usually occur, even in young smokers. People with the inherited form of early-onset emphysema are at risk for early death unless the disease is treated and its progression is stopped or slowed. Emphysema patients who have significant, unplanned weight loss (a sign of muscle wasting) have a poorer outlook, regardless of their lung function. Information on interventions to treat weight loss and fatigue in advanced stages of disease is lacking. Chronic bronchitis does not cause as much lung damage as emphysema, although the airways become blocked by mucus plugs and narrow due to inflammation. Poor air exchange leads to low oxygen levels and high carbon dioxide levels. This poor gas exchange can lead to serious, life-threatening conditions that include severe breathing difficulty and heart failure. Acute exacerbations are episodes that occur when the airways suddenly become blocked and symptoms get worse. These events are associated with inflammation in the airways and are generally triggered by an infection in the airway or throughout the body. Acute exacerbations occur, on average, between two and three times a year in people with moderate-to-severe COPD. They are most often triggered by infections. Smokers have more exacerbations than nonsmokers. A clot that blocks an artery in the lung (a pulmonary embolus) may be present in as many as a quarter of all COPD exacerbations. COPD patients are at higher risk for embolisms than the general public. Acute exacerbations get better on their own. But they are still the most common cause of hospitalization in COPD patients. Frequent episodes cause lung function to deteriorate quickly. People may not recover to the condition they were in before the last exacerbation. Nearly half of COPD patients report some limitation in daily activities. They may have trouble walking upstairs or carrying even small packages. Breathing becomes hard work. More than half of patients with COPD have difficulty sleeping (insomnia). Those with COPD are more likely to have anxiety, depression, or another psychiatric disorder than people in the general population. Women with COPD are more susceptible to psychological problems than men. Low oxygen levels also can impair mental function and short-term memory. Psychological therapy may be particularly helpful for people with COPD. People with COPD often have poor nutrition. People with chronic bronchitis tend to be obese. People with emphysema tend to be underweight. Loss of weight and muscle mass is linked to a poor outcome in COPD. Good nutrition improves the ability to exercise, which in turn builds muscle strength and lung function. Obese people with COPD who lose weight tend to sleep better. More red blood cells are produced to increase the blood's ability to carry oxygen. The heart rate increases to pump more blood.
. The right ventricle of the heart enlarges, eventually leading to heart failure. Chronic bronchitis is associated with a 50% higher risk of death from coronary artery disease, independent of the risks associated with smoking. , which can cause heart rhythm abnormalities or other life-threatening conditions. The smoking that causes COPD is associated with high risks for pneumonia, lung cancer, stroke, and heart attack. Tobacco smoke contains more than 400 substances, many of which are oxidants, metals (such as lead, cadmium, and aluminum), and cancer-causing chemicals (carcinogens). Nicotine itself may not damage tissues. But it addicts smokers to tobacco. People with a 30-year history of smoking and signs of limited airflow (most people with COPD) are at high risk for lung cancer. About half of all people with severe COPD experience sleep disorders such as sleep-related hypoxia, obstructive sleep apnea, or insomnia. Nocturnal hypoxia is treated with overnight oxygen therapy. As COPD worsens, many people have trouble falling or staying asleep. COPD patients should not use sleep medications. Nighttime oxygen or a change in COPD medications from beta-agonists to anticholinergics can sometimes help restore restful sleep. Some people with COPD may have polycythemia (increase in red blood cells). Symptoms of polycythemia include ruddy complexion, weakness, headaches, and itching of the skin. Polycythemia appears as a consequence of the chronic lack of oxygen in the blood caused by COPD, and the only treatments are those for the underlying lung disease. Osteoporosis (thin and weakened bones) is a significant problem in patients with COPD. Many conditions associated with COPD, including smoking, lack of vitamin D, sedentary lifestyle, and the use of corticosteroid medications put people at risk for bone density loss and osteoporosis. Many patients with severe COPD have GERD, a condition in which stomach acids back up from the stomach into the esophagus. However, many COPD patients don't report experiencing GERD symptoms such as heartburn. Problems with breathing and swallowing put people with moderate-to-severe COPD at increased risk for aspiration pneumonia. This condition occurs when saliva, other fluids, or food is breathed into the airways. An estimated 64 million people around the world have COPD. In the United States, about 4.9 million people have emphysema, and 9.9 million have chronic bronchitis. Because emphysema and chronic bronchitis so often occur together, it is difficult to determine the number of emphysema patients versus those with chronic bronchitis. Many people, even if their symptoms are severe, regard their condition as a natural part of aging, or blame a lack of fitness, and do not get examined by a health care provider. Allergens are allergy-causing particles and organisms such as fungi, molds, and house dust. The connection between allergies, asthma, and COPD is the topic of much debate. Some physicians believe allergies and asthma are the early stages of COPD. Another school of thought says that COPD causes changes to the airways that produce asthma symptoms. 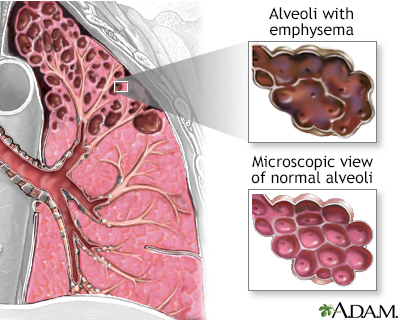 Although the exact connection is not known, people with hyperactive airways due to allergies or asthma are at increased risk for COPD. People with COPD who can control their airway problems with bronchodilators (the medication used in asthma) are less likely to die from COPD. People infected with HIV are 50% to 60% more likely to develop COPD than people who do not have HIV. The percentage of HIV patients who smoke is not much larger than those who do not smoke. This suggests that HIV itself increases susceptibility to COPD or speeds up the decline in lung function. Abnormal lung development in the womb might increase the risk for COPD later in life. Researchers have found that newborns with poor airway function are more likely to have breathing disorders as adults. Preventive measures for these children might need to start in infancy. Research also finds that eating bacon, sausage, and other cured meats might reduce lung function and increase the risk for COPD. Cured meats are high in nitrates, which act much like tobacco smoke to damage the lungs, according to researchers. Despite the widespread incidence and seriousness of COPD, studies strongly suggest that it is underdiagnosed, especially in women. Some experts recommend that any adult smoker who complains of a daily cough should be screened for COPD. In one study, nearly half of patients over age 60 who regularly smoked had COPD. Anyone who has a chronic cough, increased phlegm production, or breathing difficulty that gets worse over time, should be checked for the disease. There are usually no changes in physical appearance in people with mild-to-moderate COPD. In advanced COPD, two classic appearances have been described: "pink puffer" and "blue bloater". People with emphysema may be wasted and thin, with normal-colored pink skin. Those with chronic bronchitis may have bluish lips and fingers, be obese, and may have swollen feet and legs. Breathing may be rapid and shallow, done through pursed lips, and it may take longer to breathe out. The person will be asked to cough and produce phlegm, if possible. The best tests for diagnosing COPD and seeing how well it responds to treatment are pulmonary function tests. The gold-standard test for people with respiratory symptoms such as shortness of breath is spirometry. Spirometry measures the volume and force of air as it is exhaled from the lungs. It measures airway obstruction, it can identify COPD early, and the results are standardized. So they are always consistent. Because it is easy and reliable, spirometry is an effective method to help health professionals diagnose COPD early, when it is most treatable. Spirometry is not recommended for screening healthy adults who do not have breathing symptoms. However, it can be used to screen people with a family history of alpha-1 antitrypsin deficiency, or smokers. 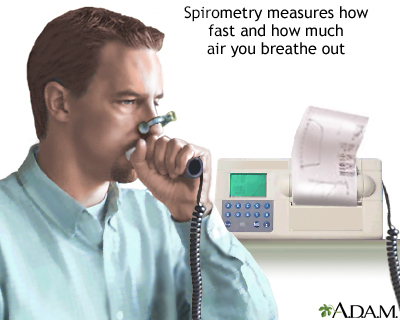 During spirometry, the person is asked to breathe in and breathe out forcefully into an instrument. This is repeated several times. The force of the air is then measured. From the results, the physician determines two important values. that a patient can breathe out with force. It indicates lung size, elasticity, and how well the air passages open and close. The ratio of FEV1 to FVC (FEV1/FVC) defines COPD. This ratio is less than 70% of normal in obstructive disease, regardless of whether the person has an FEV1 greater than 80% or less than 50%, or in other words, independent of the stage of the disease. Spirometry is a painless study of air volume and flow rate in the lungs. Spirometry is frequently used to evaluate lung function in people with diseases such as asthma, pulmonary fibrosis, cystic fibrosis, or after lung transplant.
. 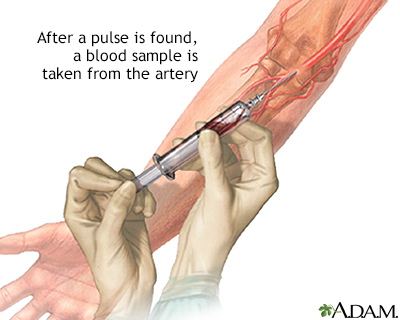 This procedure typically involves drawing blood from an artery in the wrist. A safe and painless test for measuring oxygen in the blood is called pulse oximetry, which involves placing a probe on the finger or ear lobe. The probe emits two different lights. The amount of each light the blood absorbs is related to how much oxygen the red blood cells carry. However, this test measures only oxygen in the blood and not carbon dioxide. Results should be taken together with other tests to determine the need for medication or oxygen therapy. The lung carbon monoxide diffusing capacity (DLCO) test determines how effectively gases are exchanged between the blood and airways in the lungs. People should not eat or exercise before the test, and they should not have smoked for 24 hours. The person inhales a mixture of carbon monoxide, helium, and oxygen and holds his or her breath for about 10 seconds. The gas levels are then analyzed from the exhaled breath. Results can help physicians differentiate emphysema from chronic bronchitis and asthma. People with emphysema have lower DLCO results (a reduced ability to take up oxygen). The results of this test are also important in helping to determine appropriate candidates for lung reduction surgery. Carbon monoxide diffusion levels that are 20% or less than predicted values pose a very high risk for poor survival. The measurement of nitric oxide (NO) in exhaled breath has been investigated as a marker but is not typically used for diagnosis. In most people with COPD, exhaled NO levels are below normal. Levels above normal in a person with COPD indicate airway inflammation and that the person may also have asthma. Chest x-rays are often performed. But they are not very useful for detecting early COPD. By the time an x-ray reveals COPD, the patient is already well aware of the condition. However, x-rays can look for tumors, infections, and other lung problems. Abnormally large amounts of air in the lung. A smaller heart (if the person has heart failure, the heart becomes enlarged and there may not be signs of over-inflated lungs). Larger amounts of air in the lower lungs in people with emphysema related to alpha-1 antitrypsin deficiency. Chest x-rays are rarely useful for diagnosing chronic bronchitis, although they sometimes show mild scarring and thickened airway walls.
) in the lungs. The location of the bullae can have implications for therapy of emphysema. It is important to note that screening CT scans produce many false-positive results. This means that many people have suspicious findings on a CT scan that do not turn out to be cancer after a lung biopsy is done. The CT scan can also detect incidental abnormalities like emphysema. Questionnaires and short exercise tests are very useful for determining the severity of COPD. Physicians will typically test for the enzyme alpha-1 antitrypsin in COPD patients who are non-smokers and in people who develop COPD symptoms before age 45. Additional tests may be required if the physician suspects other medical problems. If the person has pneumonia, for instance, blood and sputum tests and cultures may be performed to determine the cause of infection. Using a bronchodilator can usually relieve the symptoms of asthma. However, people with COPD typically have a limited response to bronchodilation. A bronchodilator challenge test may help distinguish between the two diseases. Some people with COPD experience limited and temporary improvement in FEV1 30 to 45 minutes after inhaling medication from a metered dose inhaler. However, their airflow remains poor and response is much lower than in asthma. Stage I: Smoker's cough, little or no shortness of breath, no other symptoms of COPD, FEV1 greater than 80% of predicted. Stage II: Shortness of breath on exertion, sputum-producing cough, some symptoms of COPD, FEV1 50% to 80% of predicted. Stage III: Shortness of breath on mild exertion, FEV1 30% to 50% of predicted. Stage IV: Shortness of breath on mild exertion, right heart failure, bluish skin, nails, and lips (cyanosis), FEV1 less than 30% of predicted. * Note: FVC -- Forced vital capacity: the maximum volume of air that you can forcibly breathe out from the lungs. FEV1 -- Forced expiratory volume in 1 second: the amount of air you can breathe out during the first second after you take your deepest breath. Group A - low risk, less symptoms - Any short-acting bronchodilator may be used as necessary. Group B - low risk, more symptoms - Long-acting bronchodilators, either anticholinergic (antimuscarinic) or beta-adrenergic agonist. Group C - high risk, less symptoms - Inhaled corticosteroids and long-acting anticholinergic (antimuscarinic) alone or long-acting beta-adrenergic agonists, pulmonary rehabilitation. Group D - high risk, more symptoms - Multiple drug therapy and individual management are required, including inhaled corticosteroids and other drugs, long-term oxygen therapy, and pulmonary rehabilitation. Surgical options are considered. Stopping smoking is the first and most important step in treating COPD and slowing its progression. Quitting smoking decreases symptoms of breathlessness and cough, as well as the risk for heart disease, likely due to decreased inflammation. Good nutrition is always important. Dietary issues become critical in late COPD, when breathing is difficult. Many people with COPD lose muscle tone and body mass and appear to waste away. This may be due to the extreme effort it takes to breathe, which rapidly consumes calories. Some people find it difficult to stop the effort of breathing long enough to chew food. A nutritionist can find the right foods and design meal plans to help COPD patients be as healthy as possible. There is not strong evidence to support the use of nutritional supplements in patients with COPD. Medications that relax the bronchial muscles and open up the airways are an important part of treating COPD. 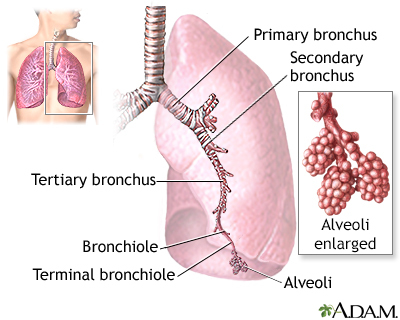 Opening up the airways is called bronchodilation. Bronchodilators do not change the overall course of the disease. However, these medications help improve breathlessness, the ability to exercise, and quality of life. When your symptoms do not occur very often and your COPD is not severe, you may use a bronchodilator medicine only as needed for your symptoms. The effects of the inhaled medicine lasts a few hours. This type of inhaler medicine is called short acting. As symptoms become more frequent or COPD becomes more severe, inhalers will likely be needed every day. These inhalers are called long-acting drugs and you only need to use them once or twice a day, depending on which one is prescribed. It is important to use these inhalers every day whether or not your symptoms are present. Inhaled corticosteroids (ICS) may be added to bronchodilator inhalers just described for patients with more severe COPD and more frequent exacerbations. Side effects include oral infections and hoarseness. However, regular use of inhaled corticosteroids for people who experience frequent exacerbations may be tried, as they can decrease their frequency. Supplemental oxygen affects all of these factors, along with the lungs' ability to exchange carbon dioxide for oxygen. There is some evidence that supplemental oxygen may also reduce heart problems in people with COPD. Pulmonary rehabilitation is a proven method of relieving shortness of breath (dyspnea), reducing hospitalizations and disability from COPD, increasing exercise capacity, and improving mental and physical quality of life, although there is no proof that it improves survival. This treatment is recommended for people with stable chronic lung disease who are affected by respiratory symptoms. Although pulmonary rehabilitation doesn't improve lung function, it strengthens muscles and improves other body systems to minimize the effects of lung dysfunction. While once considered mainly for those with severe disease, it has been shown to be effective in helping people with less severe disease as well. People are usually assessed at the beginning and end of the program. Programs generally last 6 to 12 weeks. But longer programs appear to provide more long-term benefits. Exercise is important for maintaining strength and endurance, both of which are greatly affected by COPD. Weight-bearing exercises are important for maintaining quality of life and the ability to live independently. For the greatest benefit, programs should combine low- and high-intensity exercise with strength and endurance training. Home-based exercise programs can also help people with COPD. Receiving supplemental oxygen during rehabilitative exercise may improve patients' endurance. There is no evidence that inspiratory muscle training (training the muscles used to breathe in) is effective during pulmonary rehabilitation. Older adults are at greater risk for complications or death from COPD, and their treatment needs to be tailored accordingly. Treatment in this group includes short- and long-acting bronchodilators, vaccines, and quitting smoking. The goal of COPD treatment, in addition to providing symptom relief, is to prevent exacerbations. Each exacerbation causes lung function to decline. Bringing lung function back to its pre-exacerbation state can take 6 months. When exacerbations are frequent, lung function may never return to normal, and the patient's condition spirals downward. Exacerbations are most commonly caused by bacterial or viral infections, or by air pollution. The cause is never identified in about one third of patients. Supplemental oxygen with controlled oxygen therapy and noninvasive positive pressure ventilation. Inhaled anticholinergics or short-acting beta-2-agonists may be used. In this situation nebulized forms are frequently used. Theophylline is not recommended, because it provides very little benefit and carries a risk of serious side effects. Corticosteroid medications may be given either through a vein (intravenously) or by mouth (orally), for up to 2 weeks. While 14 day treatment is common, a 5 day course may be just as effective in keeping people from having another attack for at least 6 months. These may be used if there are signs of infection, such as fever or yellow or green phlegm. For some people, initiating pulmonary rehabilitation after an acute attack can also be effective in reducing hospitalization and improving symptoms. Anticholinergic medications relax the bronchial muscles and open up the airways. Anticholinergics used for COPD include short-acting ipratropium (Atrovent) and long-acting such as tiotropium (Spiriva) or umeclidinium (Incruse) or glucopyrrolate (Lonhala and Seebri) and aclidinium (Tudorza). They are considered standard maintenance medications for COPD. Long-acting anticholinergic medications are also being given along with inhaled corticosteroids and long-acting beta-agonists. Although the combination may not reduce the number of exacerbations, it improves lung function and quality of life, and it reduces hospitalizations. For people who experience frequent symptoms of COPD, current guidelines support long-acting anti-cholinergic or beta-agonist inhaler as primary therapy for COPD, supplemented by regular use of inhaled corticosteroids. Anticholinergic inhalers are also available as a single inhaler or combined with a beta-agonist. Combivent contains both ipratropium and the common short acting beta-2-agonist albuterol. Anoro Ellipta and Stiolti Respirmat, combined anticholinergic and long-acting beta-2-agonists have been approved for once daily use. Recently a once daily combination of inhaled steroid, anticholinergic, and long-acting-beta-2 agonist has been approved (Trelegy Ellipta). Anticholinergics have few severe side effects, and they are less likely to interfere with sleep than the other standard inhaled medications. Side effects include mild cough and dry mouth. Anticholinergics should be used cautiously in people with glaucoma or an enlarged prostate. Some studies have linked the long-acting anticholinergic tiotropium with an increased risk for heart problems, but other studies are reassuring. More research is needed. When anticholinergics are no longer enough -- and sometimes in place of an anticholinergic medication -- health care providers will prescribe a beta-2-agonist. GOLD guidelines recommend that all patients with COPD stages II to IV take a long-acting beta-2-agonist. There is no evidence that one beta-2-agonist is better than another. Newer beta-2-agonists, including levalbuterol (Xopenex), have more specific actions than the older medications. Most are inhaled and are effective for 3 to 6 hours. Long-acting bronchodilators are more effective than short-acting bronchodilators for patients with more significant long-term symptoms. Long-acting beta-2-agonists salmeterol (Serevent) and formoterol (Foradil) are proving to be particularly effective as long-term maintenance therapy for COPD. Newer ones include indacaterol (Arcapta) and olodaterol (Striverdi). They reduce exacerbations by 20% to 25%, they may help prevent bacteria from building up on the airways, and they may offer real improvements in lung function. A nebulized formulation of formoterol is also available for the treatment of COPD. Some inhalers combine a long-acting beta-2-agonist and a corticosteroid (such as Advair, Seretide, Breo, Dulera and Symbicort). Combining a corticosteroid and long-acting beta-2-agonist reduces exacerbations and improves lung function slightly, but it may increase the risk of pneumonia. Large, long-term studies are needed to assess efficacy and safety over time. Side effects of both long- and short-acting beta-2-agonists include anxiety, tremor, restlessness, and headaches. People may experience fast and irregular heartbeats. A physician should be notified immediately if such side effects occur, particularly in people with existing heart conditions. Such people face an increased risk of sudden death from heart-related causes. This risk is higher with medications taken by mouth or through nebulizers, but there have also been reports of heart attacks and chest pain (angina) in some people using inhaled beta-2-agonists. All long-acting beta-2-agonists come with a boxed warning about an increased risk of asthma-related deaths, but there is no clear evidence that people who have COPD without asthma are at increased risk. There has been some concern that short-acting beta-2-agonists may become less effective when taken regularly over time. A major concern is that people who perceive beta-2-agonists as being less effective may overuse them. Overdose can be serious and, in rare cases, even life threatening, particularly in people with heart disease or asthma. Corticosteroids are powerful anti-inflammatory drugs. Oral corticosteroids are reserved for treating COPD exacerbations, and research finds that they are better than inhaled corticosteroids for this purpose. They speed the time to recovery and reduce the length of the hospital stay, but they do not reduce mortality or affect the long-term progression of the disease. They shouldn't be regularly used for stable disease because of the increased risk of side effects. Oral corticosteroids are recommended for the initial treatment of people who are hospitalized for COPD exacerbations, yet research finds that most people are given IV steroids instead. Inhaled corticosteroids (ICS) are the mainstay of asthma therapy. However, their primary use in COPD is to treat exacerbations, rather than for long-term maintenance. Side effects include oral infections and hoarseness. A review of evidence has shown that both long-acting beta-agonists (LABA) and inhaled corticosteroids (ICS) yield similar benefits for COPD patients when used as individual therapies. However, long-acting beta-agonists are slightly better at improving lung function, and ICS are slightly more effective at improving quality of life, but increase the risk of pneumonia. Therefore, current guidelines support long-acting beta-agonists as primary therapy, supplemented by regular use of corticosteroids for people who experience frequent exacerbations. Methylxanthines (primarily slow-release theophylline) are also bronchodilators, which relax the airways of the lungs. These drugs are used in people with more severe exacerbations that do not respond completely to corticosteroids, oxygen, or antibiotics. These drugs do not significantly improve lung function, symptoms, or overall outcomes when used for acute exacerbations. Some experts believe that the modest benefits do not outweigh the risk for toxic side effects from these drugs. Side effects are generally related to the amount of theophylline in the blood. At high doses, side effects can include nausea, anxiety, headaches, insomnia, vomiting, irregular heartbeat, tremors, and seizures. Many COPD drugs are inhaled using metered dose inhalers, dry powder inhalers, or nebulizers. The standard device for delivering COPD medication is the metered-dose inhaler (MDI). This device allows precise doses to be delivered directly to the lungs. A holding chamber, or spacer, improves delivery by giving the patient more time to inhale the medication. Dry powder inhalers (DPIs) deliver a powdered form of the drug directly into the lungs. DPIs are as effective as MDIs and are easier to manage, especially for older adults. Humidity or extreme temperatures can affect DPI performance, so these devices should not be stored in humid places (such as bathroom cabinets) or in locations with high temperatures (such as car glove compartments during the summer months). Respimat delivers a fine-mist spray that is created by forcing the liquid medication through nozzles. It does not use any propellant. A nebulizer is a device that administers the drug in a fine spray that the patient breathes in. Nebulizers are often used in hospitals or when the patient cannot use an inhaler. This metered-dose inhaler is a quick way of administering medicine directly into the bronchial passageways to promote clearer breathing. People with persistent coughing and phlegm often use medications that loosen secretions and help move them out of the lungs. Expectorants, such as guaifenesin (found in common cough remedies), stimulate the flow of fluid in the airways and help move secretions using the motion of cilia (the hair-like structures in the lung) and coughing. Expectorants have not been shown to benefit people with COPD. Mucolytics contain ingredients that make thick phlegm more watery and easier to cough up. Although mucolytics are not generally recommended for people with COPD, there is some evidence that they may reduce exacerbations by a small amount in some patient with moderate-to-severe COPD who take these medications throughout the winter. The most effective mucolytic is stopping smoking. Anticholinergics appear to decrease the production of mucus. Beta-2-agonists and theophylline improve mucus clearance. The same drugs used to lower cholesterol may also help protect the lungs of COPD patients, in part due to their anti-inflammatory effects. However, more research is needed to prove these benefits, and to determine the optimal statin dose for COPD patients. Some people with alpha-1 antitrypsin deficiency are treated with weekly or monthly intravenous infusions of alpha-1 antitrypsin. Research finds that this therapy can't be recommended for COPD patients without alpha-1 antitrypsin deficiency, because the treatment is expensive and there is not enough evidence to show that it reduces exacerbations or improves lung function. is a medication which can reduce exacerbations in patients with frequent exacerbations. This medication can slightly increase the risk of death in treated patients, so it should be given only to carefully selected patients. to prevent exacerbations is generally not recommended therapy. However, a certain type of antibiotics called macrolides may help reduce inflammation. As a result, people who have frequent exacerbations despite maximal treatment, may be prescribed azithromycin to be taken daily. People with COPD are at increased risk for pneumonia, but any lung infection can worsen symptoms and speed deterioration of lung function. People with acute bronchitis or pneumonia who have signs of bacterial infection, such as green or yellow phlegm, usually need antibiotics. Streptococcus pneumoniae, Haemophilus influenzae, and Moraxella catarrhalis are the most common causes of pneumonia or exacerbations in people with COPD. The choice of antibiotic depends on the bacteria being treated and bacterial resistance to common antibiotics in the area. Giving preventive antibiotics to people with frequent exacerbations is not recommended because this practice contributes to the development of bacterial resistance. When it comes to treating acute exacerbations of chronic bronchitis, so-called second-line antibiotics (amoxicillin, clavulanate, macrolides, second- or third-generation cephalosporins, and quinolones) appear to be more effective than, and just as safe, as first-generation antibiotics (ampicillin, doxycycline, and trimethoprim/sulfamethoxazole). Beta-lactam antibiotics include penicillins, cephalosporins, and some newer medications. They share common chemical features, and all interfere with bacterial cell walls. Penicillin derivatives called aminopenicillins, particularly amoxicillin (Amoxil, Polymox, Trimox, Wymox, or any generic formulation), are now the most commonly used penicillins. Amoxicillin is inexpensive, and at one time it was highly effective against S pneumoniae. Unfortunately, bacterial resistance to amoxicillin has increased significantly, both among S pneumoniae and H influenzae. Ampicillin is similar, but it requires more doses and has more severe gastrointestinal side effects than amoxicillin. Amoxicillin-clavulanate (Augmentin) is known as augmented penicillin. It works against a wide spectrum of bacteria and is used for more severe exacerbations. An extended-release form is also available. Many people have a history of allergic reaction to penicillin, but some evidence suggests the allergy may not return in a significant number of adults. Skin tests are available to help determine whether someone with a history of penicillin allergies could tolerate these important antibiotics. Second generation: cefaclor (Ceclor), cefuroxime (Ceftin), cefprozil (Cefzil), and loracarbef (Lorabid). Third generation: cefpodoxime (Vantin), cefdinir (Omnicef), cefditoren (Spectracef), cefixime (Suprax), and ceftibuten (Cedax). Ceftriaxone (Rocephin) is an injected cephalosporin. These antibiotics are effective against a wide range of Gram-negative bacteria, and some are also able to treat penicillin-resistant S pneumoniae infections. Fluoroquinolones (quinolones) interfere with the bacteria's genetic material to prevent them from reproducing. These antibiotics are used for more severe exacerbations. "Respiratory quinolones" are currently the most effective drugs available against a wide range of bacteria. These drugs include levofloxacin (Levaquin) and gemifloxacin (Factive). Levofloxacin was the first drug approved specifically for penicillin-resistant S pneumoniae. Some of the newer fluoroquinolones need to be taken only once a day. The fourth-generation quinolones moxifloxacin (Avelox) is proving effective against anaerobic bacteria. S pneumoniae strains that are resistant to the respiratory quinolones are uncommon in the United States, but resistance is increasing. Many quinolones cause side effects, including sensitivity to light and nervous system (neurologic), psychiatric, and heart problems. Pregnant women should not take this class of drugs. Quinolones also enhance the potency of oral anti-clotting drugs. These antibiotics are effective against atypical bacteria such as mycoplasma and chlamydia. All but erythromycin are effective against H influenzae. Macrolides and azalides are also used in some cases for S pneumoniae and M catarrhalis, but there is increasing bacterial resistance to these medicines. Macrolides have been shown to reduce exacerbations with chronic use, irrespective of respiratory cultures. Tetracyclines inhibit the growth of bacteria. They include doxycycline, tetracycline, and minocycline. They can be effective against S pneumoniae and M catarrhalis, but bacteria that are resistant to penicillin are also often resistant to doxycycline. The side effects of tetracyclines include skin reactions to sunlight, burning in the throat, and tooth discoloration. Trimethoprim-sulfamethoxazole (Bactrim, Cotrim, and Septra) is less expensive than amoxicillin and is particularly useful for adults with mild bacterial upper respiratory infections who are allergic to penicillin. The drug is no longer effective against certain streptococcal strains. It should not be used in people whose infections occur after dental work, or in people who are allergic to sulfa drugs. Allergic reactions can be very serious. Lung function may eventually worsen to the point that patients need supplemental oxygen delivered through portable or stationary tanks. Your doctor will monitor the oxygen levels in your blood. This may be done when resting, when being active, or at night while you sleep. Lung oxygen level below 55 mm Hg (or an arterial oxygen saturation at or below 88%) while resting. Lung oxygen level below 60 mm Hg (or whose arterial blood oxygen saturation is 89%) while resting, plus right heart failure or an abnormal increase in red blood cells. Pulse oximetry is a method used to measure the oxygen level (or oxygen saturation) in the blood. The device measures oxygen in peripheral tissues (such as the finger, earlobe, or nose) as a general indicator. Oxygen saturation should always be above 95%, although in those with long-standing respiratory disease, it may be lower. Supplemental oxygen may also benefit patients with moderately low blood oxygen levels, but more research needs to be done to confirm this. Ideally, people should receive enough oxygen to keep the oxygen level at 65 mm Hg, but no less than 60 mm Hg, or at an oxygen saturation level of at least 90%. People may need extra oxygen flow during sleep or physical activity. Almost half of people improve enough in 1 month to stop continuous treatment, although these people should be observed closely. COPD often gets worse, and people need to restart oxygen therapy. Some people get worse in spite of treatment, although it is not possible to predict who is at risk for oxygen therapy failure. The addition of nitric oxide, a gas that widens blood vessels, may offer additional benefits. People whose oxygen level drops below 55 mm Hg (or an arterial oxygen saturation at or below 88%) only while exercising may benefit from supplemental oxygen during physical activity. Supplemental oxygen may improve endurance, and it enhances the delivery of oxygen to the muscles while they are working. People whose oxygen level drops below 55 mm Hg (or an arterial oxygen saturation at or below 88%) during sleep may need oxygen at night. Such patients usually experience fitful, poor-quality sleep. This type of oxygen therapy does not appear to affect survival or prolong the time until patients need continuous oxygen therapy. People on continuous oxygen therapy who are traveling by plane should increase their oxygen by 1 to 2 liters per minute during the trip. People on intermittent oxygen therapy may need oxygen during air travel if the trip is longer than 2 hours and they develop symptoms, or if they experience a drop in oxygen levels before traveling. Many airlines will provide oxygen, especially if notified 48 to 72 hours in advance. It is important to note that aircraft cabins are pressurized to the equivalent of 8,000 feet above sea level. Such pressures could be potentially dangerous for people with severe COPD. Unless they are bed-bound, people usually use a combination of stationary and mobile oxygen systems. The most common stationary oxygen system is the concentrator, an electrical device that pulls oxygen from the air. It weighs about 35 pounds and cannot be battery operated, so a patient can use it only at home. Portable units containing electronic oxygen-conserving devices weigh only a few pounds and can provide up to 8 hours of oxygen. Some portable units weigh 6.5 lbs, with liquid oxygen supplies that last 4 hours. Some weigh 9.5 lbs, with an oxygen supply that lasts 8 hours when used at a flow rate of 2 liters per minute. Portable concentrators with rechargeable batteries are also a popular travel device. Oxygen can be administered from large stationary tanks or small portable ones, either as compressed gas or liquid oxygen. A container of liquid oxygen lasts four times longer than compressed gas of the same weight, and it is easier to fill. Liquid oxygen is very beneficial for patients who want to maintain an active life, although the tanks require occasional venting to release pressure, and this wastes oxygen. They are also more expensive. Supplemental oxygen is a fire hazard, and some hotels and residences do not allow its use. No one should smoke near an oxygen tank, and tanks should be stored safely, secured to a wall and away from heaters and furnaces. Oxygen is usually administered in one of three ways: through a nasal canula, transtracheal catheter, or electronic demand device. Using a nasal canula, oxygen is delivered through a long, thin plastic tube that runs from the oxygen tank to small plastic prongs that fit in the nostrils. The tube can be very long when attached to a stationary tank in order to accommodate walking throughout a house, or relatively short when attached to a portable unit. A reservoir pouch is an innovation added to this device that provides an extra rush of oxygen when a patient starts to inhale. This method is inexpensive and easy to use, but some patients are embarrassed by its appearance under their noses. Transtracheal oxygen is delivered directly into the windpipe (trachea) through a catheter tube implanted by a surgeon. The device is inconspicuous, and patients are very likely to use it. Long-term complications may include infection, dislodgement, and blockage by mucus, which can be very serious. Complications of the procedure itself occur in 3% to 5% of cases and can include lung spasms and uncontrollable coughing. Electronic devices that sense the beginning of a breath and deliver a pulse of oxygen are also available, although they are complicated, expensive, and have a risk for mechanical failure. Newer units have a continuous flow bypass switch that allows oxygen to still be delivered if the battery runs down. In emergency situations, oxygen may be delivered to the patient in various ways. If the patient is able to breathe naturally, oxygen is delivered through a tube using a tightly fitted oxygen mask to maintain airway pressure during breathing. Some physicians now believe such devices should be first-line treatments (in addition to medications) for managing respiratory failure after an acute exacerbation. NPPV allows the patient to talk and drink fluids, and is much easier to tolerate than nose or throat tubes. It cannot be used on patients with rapidly deteriorating COPD, those who are uncooperative, or those who have a facial shape that does not allow the mask to seal tightly. may be required to deliver high concentrations of oxygen. With intubation, a tube is inserted down through either the nose or the mouth, and oxygen is given through the tube. In very serious cases such as acute respiratory failure, a mechanical ventilator can be used to take over the function of breathing. The primary goal of ventilation is to remove carbon dioxide and restore a balanced exchange of gases. Most people have a low tolerance for intubation, and the tubes are often removed early due to discomfort. People with these tubes may need painkillers, sedatives, or muscle relaxants. If they are needed chronically, this is usually done via a hole in the neck, a tracheostomy. Some preliminary evidence suggests that IV corticosteroid use in patients with COPD on mechanical ventilation may reduce the length of time mechanical ventilation is needed and improve the success of noninvasive mechanical ventilation. Two endobronchial valve systems (Spiration and Zephyr) have been approved by the FDA and can be utilized in people with severe COPD. They function as one way valves that can help collapse diseased areas and improve lung function and symptoms for patients. Quitting smoking is the first and most essential step in treating COPD and slowing its progress. In many people who quit early, lung function stabilizes and eventually declines to about the rate of nonsmokers in the same age group. In some people, lung function may even improve slightly after quitting. As COPD progresses, quitting smoking can slow the rate of decline; however, lost lung function is never fully recovered. Most people who smoke try to quit an average of seven times before they are successful. Using a combination of smoking cessation aids improves the likelihood of quitting. These include nicotine replacement products (such as patches, gum, nasal spray, and lozenges), counseling, and prescription medications such as bupropion (Zyban) and varenicline (Chantix). People should wash their hands with ordinary soap before eating and after going outside the home. Antibacterial soaps add little protection, particularly against viruses. Two important vaccinations are recommended to protect against respiratory infection. Seasonal influenza vaccination. People with COPD should be vaccinated against influenza each year at least 6 weeks before flu season begins. Flu shots appear to help reduce exacerbations of COPD during flu season. Pneumococcal vaccine. The adult-type pneumococcal vaccine protects against 23 types of pneumococcus, a common cause of pneumonia. Everyone with COPD should have this vaccine at least once. People who had their first shot more than 5 years previously may benefit from a booster vaccine. Adults at high risk should also receive the PVC13 pneumococcal vaccine that was initially approved for children. The vaccine remains effective for years. Flu and pneumococcal vaccines can be given at the same time without increasing side effects. First, inhale through the nose, moving the abdominal muscles outward so that the diaphragm lowers and the lungs fill with air. Exhale through the mouth with the lips pursed, making a hissing sound. Take twice as long breathing out as you did breathing in, so that there is pressure in the windpipe and chest, and trapped air is forced out. A simple technique is to inhale deeply and slowly, hold the breath for 5 to 10 seconds, then cough while breathing out. 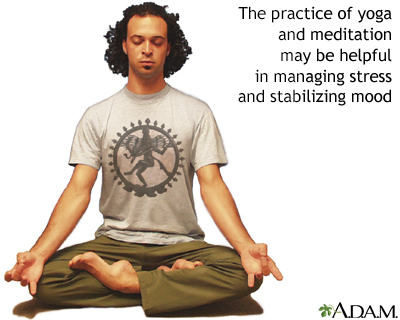 Breathing exercises have been shown to improve functional exercise capacity and tolerance. The exercises do not seem to reduce other symptoms such as shortness of breath, or improve quality of life. People with congestion and heavy phlegm should drink plenty of fluids and keep their homes humidified. Chest therapy involves breathing in rhythmically for three to four deep breaths, then coughing to produce phlegm. Tapping the chest may also help loosen and bring up phlegm in people who produce a lot of it. Avoid chest therapy during an acute exacerbation of COPD. When coughing to produce mucus, another method is to lean forward and "huff" repeatedly. Take relaxed breaths, and then huff again. Avoid forceful coughing, if possible. COPD is not simply a lung condition, but a disease that causes wasting of the muscles and bones. So certain physical exercises may be very helpful. Exercising and strengthening the muscles in the arms and legs helps some patients improve their endurance and reduce breathlessness. These exercises may also help with everyday activities, like climbing stairs and standing up from a chair. Exercising only one leg at a time (for example, pedaling a stationary bicycle with one leg instead of two) might benefit people who are usually too out-of-breath to exercise, and help them increase their exercise capacity. Walking is the best exercise for people with emphysema. In studies of lung rehabilitation, regular exercise increased walking distance and improved breathing. People should try to walk three or four times a day for 5 to 15 minutes each time. Devices that assist with breathing may reduce the breathlessness that occurs during exercise. Yoga and tai chi, two practices that use deep breathing and meditation techniques, may be particularly beneficial for COPD patients. Research is underway to determine whether yoga is helpful for COPD patients. Because many people with chronic bronchitis are obese and many with emphysema are underweight, nutrition assessment is an important part of COPD treatment. Not getting enough of foods that are rich in vitamins A, C, and E, and having a lack of fruits and vegetables can contribute to the development of the disease. Healthy foods are as important for lung function as they are for general health. Specific foods that may be important for healthy lungs are those that contain antioxidants (fresh, deep green and yellow-orange fruits and vegetables), selenium (fish, nuts, red meat, grains, eggs, chicken, liver, and garlic), plant chemicals called flavonoids (apples, onions), and magnesium (green leafy vegetables, nuts, whole grains, milk, and meats). One study found that, compared to a Mediterranean diet, which is high in fruits, vegetables, and whole grains, a Western diet high in red meat and simple carbohydrates increased the risk for COPD fivefold. Vitamin supplements are not helpful, and they may be very harmful for smokers. A trial of COPD patients showed that acupuncture (along with standard medication) helped reduce shortness of breath on exertion in patients with COPD. More research is necessary to assess acupuncture as a treatment option. People may need to arrange for some services in advance, such as in-flight oxygen or wheelchairs and they may need to notify the airline of certain medications, ventilators or continuous positive airway pressure (CPAP) machines. COPD patients may consider obtaining a frequent traveler's medical card (FREMEC). People with COPD are at high risk for depression and anxiety, which can impair their outlook on life. Depression often gets worse as people with COPD need to limit their activities and social interactions. Psychological counseling and social support are important for helping people improve their emotional state, cope with daily stresses, and maintain their independence and social relationships. Avoid exposure to pollen, pet dander, house dust, and mold. Eliminate molds and mildew from household water damage. Make sure wood-burning stoves or fireplaces are well ventilated and meet the Environmental Protection Agency's safety standards. Burn only pressed wood products labeled "exterior grade," because they contain the fewest pollutants. Ventilate by keeping windows open (weather permitting), using exhaust fans for stoves and vents for furnaces, and keeping fireplace flues open. Surgery, as a last resort, may help some people with very severe COPD. Coverage for such procedures varies among insurance carriers. A major drawback is that people must be in good enough health to undergo major surgery. By the time COPD is advanced, however, this is usually not the case. As a result, surgery cannot help most COPD patients. The three available surgical options that are appropriate for some people with COPD are lung transplantation, lung-volume reduction surgery, and bullectomy. Three-year survival rates after lung transplantation are about 65% for patients with emphysema or alpha-1 antitrypsin deficiency. People may have a transplant of one lung, both lungs, or the lungs plus the heart (more rarely, if concomitant severe heart problems exist). The increasingly long waiting time for donor organs and the extraordinary expense are both obstacles to this procedure. The best candidates are under age 65 and have severe lung disease, with a life expectancy of less than 18 months. However, lung transplantation is becoming more out of favor for people with end-stage COPD because it is unclear whether it provides a significant survival benefit. Up to one third of people awaiting lung transplantation die before a suitable donor is available. There were more than 2,000 lung transplant operations performed in the United States in 2015, according to the Organ Procurement and Transplantation Network. As of this writing, nearly 1,415 people were waiting for a new lung. The United Network for Organ Sharing (UNOS) assigns lungs for transplants based on an allocation score, rather than time spent on the waiting list. The allocation score takes into account the length of time a patient is likely to survive before and after a transplant. This policy applies to transplant candidates who are age 12 or older. Transplant patients must take drugs that suppress the immune system to prevent the body from rejecting the transplanted organ. Nevertheless, rejection is the primary cause of complications and death. The mortality rate from the procedure itself is about 3% (30-day mortality). Transplantation of both lungs leads to somewhat better outcomes compared to one lung. However, in many situations, sicker people receive one lung (easier surgery), so they naturally have worse survival. The largest study to-date, called the National Emphysema Treatment Trial (NETT), compared surgery to medical therapy. This study found that people whose emphysema was in the upper lobes of the lungs and who had poor exercise ability (poor lung function) before surgery were more likely to benefit most from surgery. These benefits included an increased chance of being alive for 5 years after the surgery, improved exercise ability, fewer symptoms, and a better quality of life. These findings are true to a lesser extent for people with upper lobe emphysema and adequate exercise capacity. In successful cases, the improvement is most notable within the first 6 months, after which the condition begins to get worse again. After 3 years, lung function deteriorates to the same level as it was before the procedure. LVRS is substantially more expensive than medical treatment. Poor lung function (FEV1 less than 40% but higher than 20% of predicted). Carbon monoxide diffusing capacity of more than 20% of predicted. Hyperinflated lungs (total lung capacity greater than 120% of predicted), generally with involvement of the upper lungs. One year after surgery, lung transplant recipients have much better lung function, greater exercise capacity, and less breathlessness than LVRS patients. However, they are less likely to survive, and the transplant is far more expensive than LVRS. Other indicators of a poor outlook include severe lung complications and air pockets in diseased areas of the lungs (bullae). ). Surgeons use either an open approach, making a large cut in the chest area, or video-assisted thoracoscopy (VATS), which is less invasive and involves several small cuts. Either method is effective and has similar complication rates. Lines of staples are typically used to reduce lung volume. ). Some centers believe this approach may cause fewer complications and the benefits last longer, although not all evidence supports its use over the bilateral method. Another option for COPD is bullectomy, in which giant air pockets and surrounding lung tissue are removed. It is generally limited to people with giant bullae (not the typical COPD patient) and those with alpha-1 antitrypsin deficiency. Centers for Disease Control and Prevention. Recommended immunization schedule for adults, United States, 2018. www.cdc.gov/vaccines/schedules/hcp/adult.html. Accessed December 6, 2018. Criner GJ, Connett JE, Aaron SD, et al. Simvastatin for the prevention of exacerbations in moderate-to-severe COPD. N Engl J Med. 2014;370(23):2201-2210. PMID: 24836125 www.ncbi.nlm.nih.gov/pubmed/24836125. Guirguis-Blake JM, Senger CA, Webber EM, Mularski RA, Whitlock EP. Screening for Chronic Obstructive Pulmonary Disease: evidence report and systematic review for the US Preventive Services Task Force. JAMA. 2016;315(13):1378-1393. PMID: 27046366 www.ncbi.nlm.nih.gov/pubmed/27046366. Herath SC, Normansell R, Maisey S, Poole P. Prophylactic antibiotic therapy for chronic obstructive pulmonary disease (COPD). Cochrane Database Syst Rev. 2018;10:CD009764. PMID:30376188 www.ncbi.nlm.nih.gov/pubmed/30376188. Ingebrigtsen TS, Marott JL, Nordestgaard BG, Lange P, Hallas J, Vestbo J. Statin use and exacerbations in individuals with chronic obstructive pulmonary disease. Thorax. 2015;70(1):33-40. PMID: 25349333 www.ncbi.nlm.nih.gov/pubmed/25349333. Martineau AR, James WY, Hooper RL, et al. Vitamin D3 supplementation in patients with chronic obstructive pulmonary disease (ViDiCO: a multicentre, double-blind, randomized controlled trial. Lancet Respir Med. 2015;3(2):120-130. PMID: 25476069 www.ncbi.nlm.nih.gov/pubmed/25476069. McCarthy B, Casey D, Devane D, Murphy K, Murphy E, Lacasse Y. Pulmonary rehabilitation for chronic obstructive pulmonary disease. Cochrane Database Syst Rev. 2015;(2):CD003793. PMID: 25705944 www.ncbi.nlm.nih.gov/pubmed/25705944. Minervini F, Kestenholz PB, Paolini V, et al. Surgical and endoscopic treatment for COPD: patients selection, techniques and results. J Thorac Dis. 2018;10(Suppl 27):S3344-S3351. PMID: 30450240 www.ncbi.nlm.nih.gov/pubmed/30450240. Qaseem A, Wilt TJ, Weinberger SE, et al. Diagnosis and management of stable chronic obstructive pulmonary disease: a clinical practice guideline update from the American College of Physicians, American College of Chest Physicians, American Thoracic Society, and European Respiratory Society. Ann Intern Med. 2011;155(3):179-191. PMID: 21810710 www.ncbi.nlm.nih.gov/pubmed/21810710. Rennard SI, Drummond MB. Early chronic obstructive pulmonary disease: definition, assessment, and prevention. Lancet. 2015;385(9979):1778-1788. PMID: 25943942 www.ncbi.nlm.nih.gov/pubmed/25943942. Segal LN, Weiden MD, Horowitz HW. Acute exacerbations of chronic obstructive pulmonary disease. In: Bennett JE, Dolin R, Blaser MJ, eds. Mandell, Douglas, and Bennett’s Principles and Practice of Infectious Diseases, Updated Edition. 8th ed. Philadelphia, PA: Elsevier Saunders; 2015:chap 67. Spruit MA, Singh SJ, Garvey C, et al. An official American Thoracic Society/European Respiratory Society statement: key concepts and advances in pulmonary rehabilitation. Am J Respir Crit Care Med. 2013;188(8):e13-e64. PMID: 24127811 www.ncbi.nlm.nih.gov/pubmed/24127811. Strange C, Beiko T. Treatment of Alpha-1 Antitrypsin Deficiency. Semin Respir Crit Care Med. 2015;36(4):470-477. PMID: 26238635 www.ncbi.nlm.nih.gov/pubmed/26238635. Vanfleteren LEGW, Spruit MA, Wouters EFM, Franssen FME. Management of chronic obstructive pulmonary disease beyond the lungs. Lancet Respir Med. 2016;4(11):911-924. PMID: 27264777 www.ncbi.nlm.nih.gov/pubmed/27264777.